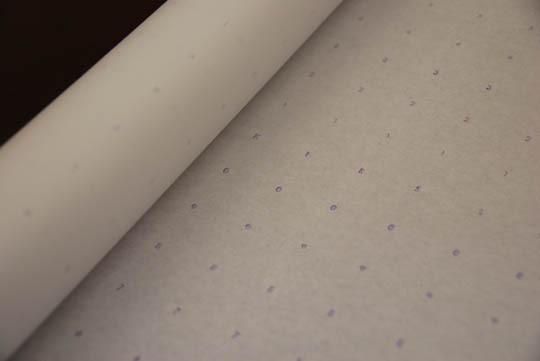 Also known as "1-to-5", "Alphabet", or "Dotted" marking paper, alpha-numeric paper is like plotter paper which has been printed with a grid of light blue numbers and/or letters and/or dots spacedone inch apart which make it easy to line up pattern pieces straight for tracing outlines. The paper is also thin enough that you can see through it to trace a pattern lying below it. It is often laid right on top of the fabric spread and cut right along with the fabric. It is too thin for most people to use for making master pattern pieces, as the edges are not rigid enough to trace around.